As you might remember, last month Choosy Beggar Tina won herself the wonderful prize of a selection of English potato chips (crisps) by picking the most enticing variety of flavors in the inaugural We Are Never Full monthly top five giveaway. 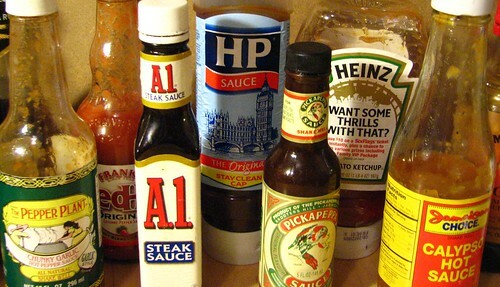 This month we’re focusing our attention on the vastly underrated group of foods that make up the world of condiments. Flexible, complimentary, multi-purpose, and flavorful, condiments are the journeymen of the food world, and have been unfairly looked down on by the gastonomic cognoscenti as only good enough to disguise the taste of flavorless food or as just a topping burgers, hot dogs and fries. No longer. Condiments of all kinds are an essential part of many kinds of dishes, both as ingredients and as sauces, and we’re giving them the respect they’re due. So, go to your fridge and tell us which of your favorite condiments are clinking together in the door. The best top five will win a bottle of our latest condiment obsession, the very wonderful Pepper Plant’s Chunky Garlic Hot Pepper Sauce. Entries must be submitted by 1:30 p.m. (EST), Monday, November 10. Will probably think of even more “favoriter” condiments after I press “submit”! This is a tough one, since I am the condiment queen. 5. my homemade BASIL PESTO, which is always in the freezer for sauces and sandwiches! 5. Home-made Nam Prik Pao. 1. Jalepeno mustard – unbelievable on a hot dog! Home made mayo mixed with either garlic, lemon or harrisa. Wow, awesome post and question to answer. I started to wonder if some items on my list are actually condiments until I realized my current status as a stay-at-home mom validates them as condiments. I’m going with these as my top 5. Ooh, my fridge door has 4 shelves which are all groaning with condiments and pickles. That said, for the purpose of this contest, I will leave the pickles out of things. I’ll even drop brand names so you know how devoted I am. Mustard – any kind. Basically, any type of mustard ever created would top this list above any other brand of any type of condiment, the only exception being honey mustard which only dilutes the mustardy deliciousness and is 99% of the time disgustingly too sweet. 1. Mayo. Preferably Hellman’s, as I’m not interested in making my own. 2. Plain yellow mustard, no Dijon, nothing fancy. 3. Soy sauce. Kikkoman has the stuff. 4. Ketchup. We likey organic, to avoid the corn syrup found in most conventional products. 5. Sesame oil. Too many brands to count, but only a few have a strong flavor. Essential, we have to have this one. Shoot….missed this one. Too busy researching and writing about food holidays for NaBloPoMo. I’ll just toss mine out there anyway.